As winter closely approaches in the UK, this week I thought I would share with you a recipe that is wonderful for a cold winters night. Ossobuco alla Milanese is a traditional Italian veal stew that requires little preparation or cooking skills but results in a wonderfully tasteful dish. As with all meals serve your Ossobuco in a pleasant setting with good friends and a generous amount of love. 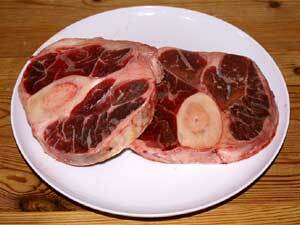 Ossobuco is traditionally served with a risotto Milanese and crusty bread. Enjoy your Ossobuco and bon appetit . . . . .